Rapport - how to gain this quickly and effectively, with patients and colleagues. Taking and, in particular, listening to the patient history, this involves chunk size of information and hypotheticodeductive model of history taking (generating diagnosis probability and testing this). Ideas / Concerns / Expectations (ICE) of the patient - looking at the NLP communication model, belief filters etc. Social history, the patient in the context of their world. Examination - just needs to be relevant! Management that is patient centred not patient controlled. Using information gained in the use of ICE and how to phrase things for maximal effect. Safety netting being specific and use of sensible timescales. Follow up, timescales that make sense. Mercedes model in NLP to manage anxieties and performance at work. The facilitator of the workshop is Dr David McDonnell, a GP Trainer, NLP Master Practitioner and author of the book ‘How to Communicate Basically Brilliantly With Patients’. We will be reimbursing travel expenses to attend the workshop so you will not have to access your study leave budget. 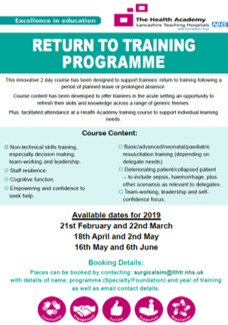 If you are interested in attending one please email SuppoRTT.nw@hee.nhs.uk. Following the success of our first KIT Event held on 17th January 2019 we are now planning the next one which we hope will take placein June 2019. Further deatails, including how to book a place, will be available here shortly. Please click the below image to open a copy of the flyer. Your School may organise events specifically aimed at returners; please contact your Educational Supervisor / TPD to enquire.